The main point of entrance in Brazil is São Paulo - Guarulhos International Airport (GRU). It is commonly called Cumbica Airport. There is a bus shuttle service from Cumbica to Campinas' downtown operated by Caprioli. The price is R$ 32 (approx. US$ 18 or € 12) and the trip generally takes 1 hour and 45 minutes. The final destination is Caprioli's agency in Largo do Pará square. This is the preferred choice if you enter Brazil through São Paulo - GRU. São Paulo - GRU is also the preferred point of entrance in Brazil for reaching Campinas. Campinas has an international airport (Viracopos Airport - VCP) located 14 km from Campinas' downtown. There is a bus shuttle service from Viracopos to downtown operated by Caprioli. The price is R$ 7 (approx. US$ 4 or € 2.50) and in general it takes 25 minutes. The final destination is Caprioli's agency in Largo do Pará square. This is an alternative choice if you enter Brazil through any other city instead of São Paulo. There are many flights connecting VCP to other domestic airports. However, if you are in São Paulo - GRU, in general you will spent more time waiting for the flight connection to VCP than if you use the bus shuttle service. UNICAMP is located in Barão Geraldo, which is a district of Campinas and distances about 15 km from Campinas' downtown. You should take a taxi to go from Caprioli's agency to UNICAMP. The price of the ride is about R$ 40 (approx. US$ 23 or € 15). 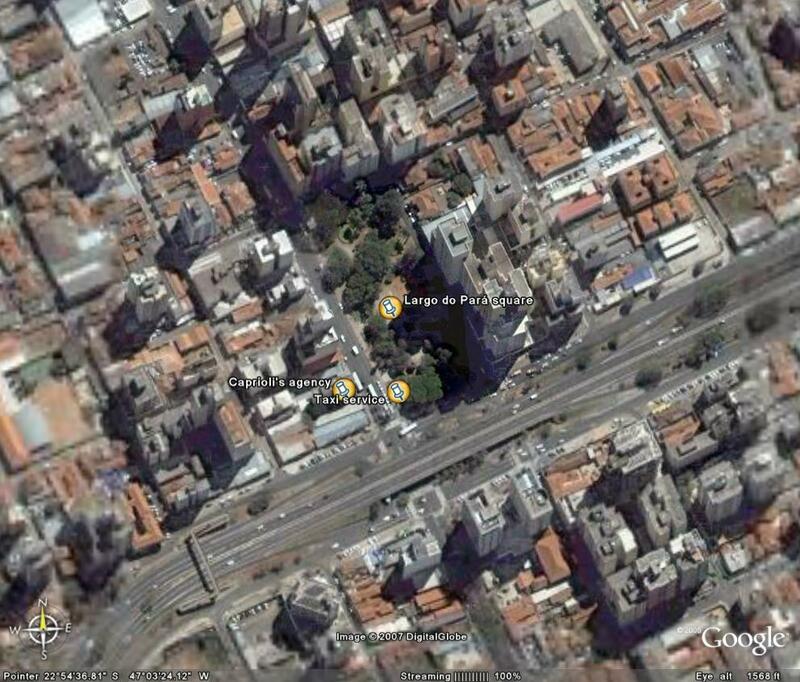 There is a taxi service in Largo do Pará square just in front of Caprioli's agency (see image here). Taxis are white with a blue strip. You should also take a taxi to go to your Hotel. The recommended Hotels, Sleep Inn Galleria or Comfort Suites Campinas, distances about 10 km from Campinas' downtown and the price of the ride is about R$ 30 (approx. US$ 17 or € 11). People who travel to Brazil are required to have a passport and in some cases an entrance visa. The passport must be valid for the period of stay in the country. The temporary visas usually emitted to foreign professor/researcher is obtained from the consular division of the Brazilian Embassy or a Brazilian Consulate in the country of origin prior to arrival in Brazil. A visa must be requested early enough to allow time for bureaucratic procedures. Brazilian diplomacy is based on visa reciprocity, which means that the majority of European nationals need nothing more than a valid passport and a return ticket to enter Brazil on tourism, while Australian, Canadian and US citizens need a visa. Click here for information about the need for a visa. as accompanying baggage. If this requirement is not respected, there may be difficulties with customs officials when leaving the country. The brazilian currency is the Real (code: BRL; symbol: R$; plural: Reais). This is the only currency accepted in daily transactions; even the American Dollar (USD) and the Euro (EUR) have limited course, as well as traveller checks - foreigners must exchange them to BRL in Currency Exchange Businesses. However, credit cards are widely accepted in cities like Campinas and almost all brazilian banks have an infrastructure such that holders of major credit cards can use brazilian ATMs to access their accounts and withdraw cash. The current BRL exchange rates to USD and EUR and its historical variation, as provided by Yahoo!Finance, are available here (BRL-USD) and here (BRL-EUR). It is worth to pay attention to the USD depreciation relative to the EUR and the BRL along the last year. The depreciation of the USD relative to the BRL was of approx. 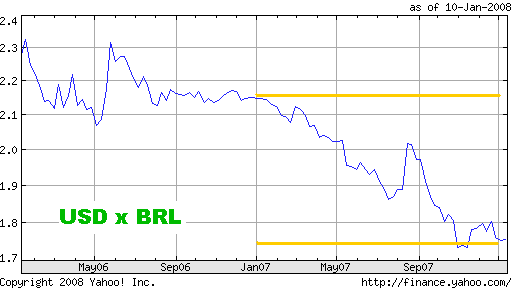 20% during 2007 (see here) while the depreciation of the EUR relative to the BRL was of approx. 5% in the same period. The climate conditions at Campinas' region are in general very good. During the last 20 years, in the end of May the average high temperature is 25 °C and the average low temperature is 14 °C (the absolute ones were 32 °C and 0 °C), the average precipitation is 50 mm from 5 raining days per month, the average humidity at 9:00 am is 73% and at 3:00 pm is 45%.